With 2017 behind us and a new year ahead, I'd like to go over a few points about the blog, its social media presence and mostly on PEPLUM TV Youtube channels. I'm thinking of making a couple of changes to the blog but I'm still not sure how to do this. I like writing articles but the problem with big articles is that there's a limit number of posts that can appear on the main page for x number of days and things can be bumped quickly, and since most visitors won't go beyond the main page, writing a big article only to have it relegated to page 2 just in a few days seems pointless. I've already done 'Post of the week' which means one big post with just a couple of other ones for the week, not the usual multiple posts per day. You might see more and more of these posts, as soon as next week. Hopefully, I'll also finally update the ULTIMATE MOST WANTED list, certainly after I recently received many great additions to my collection. 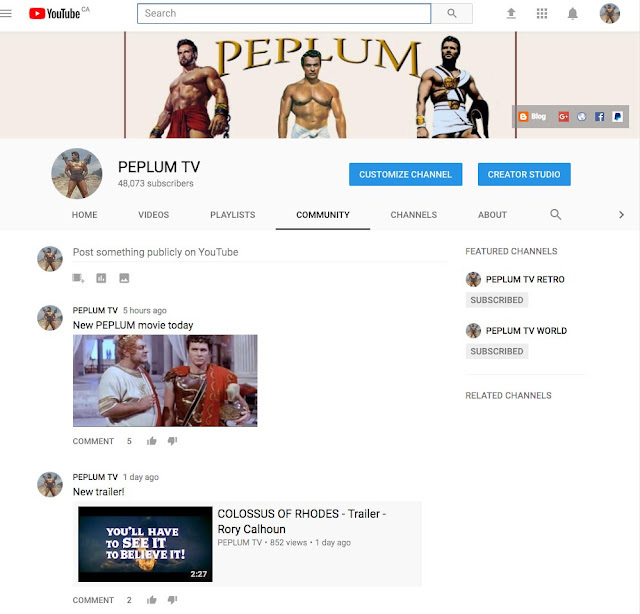 There are three PEPLUM TV Youtube channels, with a potential fourth one in the near future! Now, I don't want to bore you with the minutiae of keeping a Youtube channel. In fact, I'm thinking of scaling down my presence here at the blog for reasons which have come to light a couple of weeks ago. You see, it's all about demonetization. Demonetization is not just about how YT prevents me from making some coins from my uploads. When a video is demonetized, Youtube basically makes the video invisible to others, even to followers of the PEPLUM TV channel. YT bots decide to demonetize it if it thinks it contains questionable material. The exact wording is: 'Not suitable for most advertisers. Request review.' Because they think the material is unsuitable to most advertisers, the video itself is not promoted across Youtube. It won't appear as a suggestion, it won't on the right hand column, it won't trend. It's the best way to band a video without actually banning it. I recently had a video that went viral and it never appeared in the 'what's trending' page of Youtube. It was partially demonetized for a period of time. Therefore, during peak viewing time, it wasn't listed anywhere on Youtube. It went viral because people were sharing it, not because of Youtube's (lack of) support. What can cause a video to be demonetized or become invisible? - If a word in the text in the title or the information is problematic. So 'SLAVE' is problematic. The last movie I linked here at the blog was GIANT OF METROPOLIS, which was demonetized for days. I linked it at he blog the same day I uploaded it to Youtube. This told me that linking a video across my multiple social media platforms, Google+, Facebook, Twitter, etc, was one of the reasons why it was demonetized. This thumbnail I created for GIANT OF METROPOLIS was refused by Youtube during its initial first days. I had to use on of the awful thumbnails suggested by YT so the movie wouldn't be demonetized. When I uploaded SLAVE OF ROME back on December 4th, 2017, it was demonetized for the first two weeks. It barely got 1000 views during that time, even if my PEPLUM TV channel has 45k+ followers. When the demonetization was finally lifted, SLAVE OF ROME suddenly became visible to everyone and it now has over 200,000 views! Youtube is trying to kill my channel or tying to control who sees what at my channel in every way possible. When an upload is demonetized, it basically means few people will see it, even followers of the channel. And I've realized that one of the problems causing this is linking a new upload here at the blog or Facebook or at any of my social media platforms. Youtube, which is own by Google, is trying to limit my means of corralling as many viewers to my uploads as possible. The dilemma now is how to promote my uploads here at the blog without risking the chance of demonetization, or making them invisible. I will continue to link my videos and films here at the blog and across social media but only after the uploads have been there for a week or more. So the best thing to do is to follow my PEPLUM TV channels by clicking on that bell icon to receive notifications the moment new uploads become public. See below (next to red arrow). The other best way to get up to the minute information, and the reason for this post, is to follow the Community page of the main PEPLUM TV channel. It's a new feature and it's sorta like a blog page or a Twitter page for the channel. I've been using it for a few days and it's cool. Up to the minute announcements, on upcoming films, clips, and even polls. Make sure to check it out. I tried Patreon and it didn't work. If I were to tabulate all the followers from this blog, Youtube channels, Google+, Facebook, Twitter, Pinterest, etc, the numbers would be in and around 50k. That's a pretty good number of followers and yet few of them were willing to join in the Patreon way. In fact, only 2 patrons joined in. I actually understand this lack of support and I'm not surprised it didn't pan out: I've been doing the blog and the various incarnations of Youtube channels for almost 10 years and I never asked for any financial support before so why now? Correct? Patreons or even Paypal donations didn't exist 10 years ago and if they had existed back then, I would have used them back then. In fact, for a brief period, I did include a (different) Paypal donation button for a while before removing it. Well, the donation process via Paypal is streamlined compared to what it was years ago and now the button is back (top left). Donating through Paypal is the easiest and least demanding way to financially support my expanding endeavours. P.S. : I have everything under control (for now) so please do not try to contact Youtube on my behalf.